More on the "Valentine's Effect." 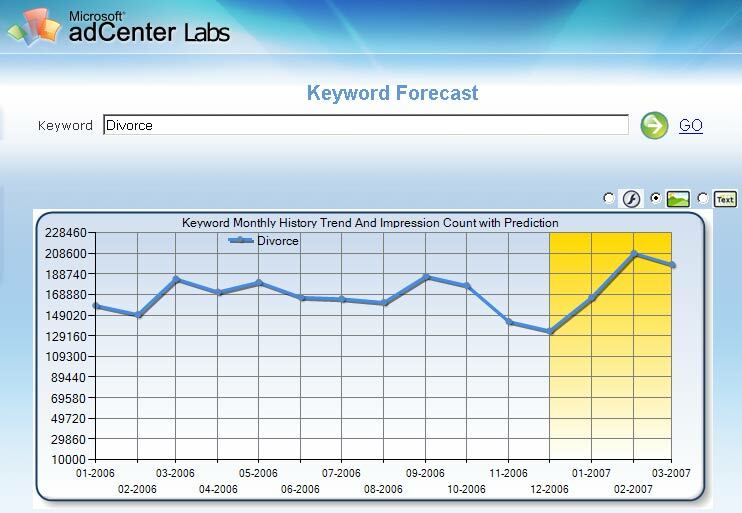 The Valentine Effect was further in evidence when a new keyword forecast search term tracking tool at Microsoft was invoked for the search term "divorce. If we check this screenshot of the Adlab interface results, we can see the definite spike in searches for the term divorce that occurs in February. Here is a text breakdown of the search requests with additional data on gender and age of the searchers. Ken LaMance's "Valentine's Effect" Makes News. Again LegalMatch's Ken LaMance makes news. Ken, in conjunction with Cheryl Smith of the marketing department at LegalMatch.com have been closely monitoring the so called Valentine's Effect, first observed here at LegalMatch in 2006. The Valentine's Effect is the tendendency for legal case presentations to the LegalMatch online client/attorney matching system to show a spike cases in the weeks leading up to and following Valentine's Day. As was published last year in a Forbes magazine article, this little understoood effect has once again been made newsworthy with articles appearing in a number of online and print publications, including The Daily Breeze, NJ.com, Lexington-Herald, and The Meter.